The New York Times Travel Show is not only a catalyst, stroking the desire to see fascinating far off places but it is also a hub to meet very interesting and creative people. One postcard being handed out caught my attention straight away! Who doesn’t love a red volkswagen? A car with character and a personality for sure. One took me all through Peru! 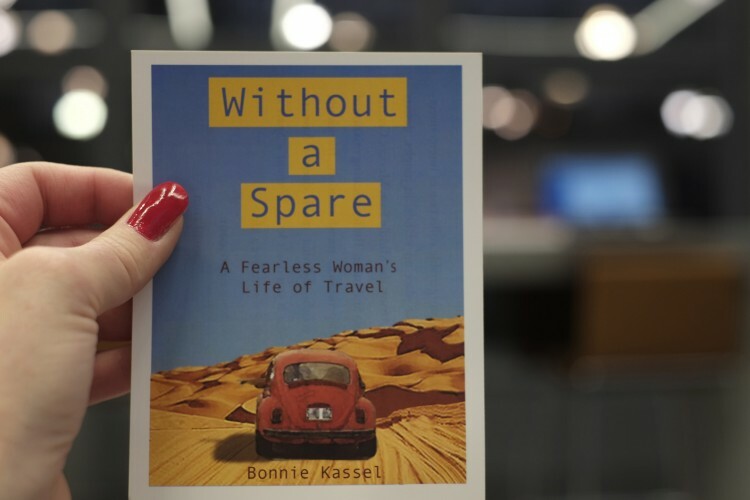 “A fearless woman’s life of travel”…yes, I am there. Put that book in my hands! I have spent the last week being on a fascinating roller coaster of travels. Bonnie is the ultimate “free spirit”. All one has to do is look at the table of contents: “Europe 101”, “Bonlez, Belgium”, “Motoring Through the Sudan”, “Eritrean Guerrillas”, “The Himalayays”, “Sri Lanka and the Maldives” to name just a few! As one who loves the visual, I was disappointed that there were so few photographs throughout the book but then I read how so many roles of film were taken while abroad (I felt Bonnie’s pain)! Her writing however was a feast for the imagination. The reader is able to breathe the same air, see vibrant colors and hear the cacophony of street sounds. Bonnie travelled with an open heart allowing so many rich and sometimes horrifying experiences to be woven into her life’s story… a train was missed but this led to crossing paths with a yacht owner! I can only imagine what an interesting conversation would have taken place if Bonnie Kassel were to sit with Robert Frost! “Two roads diverged in a wood and I took the one less traveled by, and this has made all the difference.” Reading “Without a Spare” will not only open doors to countries and cultures for the reader but will perhaps also inspire them to walk through them. ← New York Times Travel Show: Oh Take Me Away!